If you’re still on the fence about getting a WP7 phone, how’s this for a deal? AT&T will give you an LG Quantum or Samsung Focus and an 11.6-inch Acer Aspire notebook for just $199.99. That’s right, $200 will get you a phone and a laptop. AT&T usually sells this laptop for $239.99 on its own (or it’s $600 on Amazon), and it weighs 3lbs, has a 1.2GHz Intel i3-330UM Dual Core Processor, 2GB of RAM, 250GB HD, 1366×768 screen, and a 3G modem. Right, so what’s the downside? You’ll pay $299.99 out of pocket, then get a $100 mail-in rebate. And the big problem is that you need to sign up for a two-year plan for both devices — cellphone and notebook, so you’ll be paying quite a hefty monthly bill for quite some time. If you’re on the road frequently, it’s a very tempting offer. DALLAS, Feb. 11, 2011 /PRNewswire/ — Chocolates and flowers might be fine for some, but for the techie in your life, AT&T is offering the perfect pair: a Windows Phone 7 device and the Acer notebook. Beginning Sunday, and for a limited time, AT&T* customers can purchase the LG Quantum or Samsung Focus and the Acer Aspire AS1830-3595 11.6-inch notebook for only $199.99. LG Quantum™ – designed for work, play and everything in between. With a slide-out keyboard for quick use of Office Mobile®, users can stay active and up to date with work. The LG Quantum also features DLNA technology through a preloaded application called Play To, which allows users to wirelessly stream videos, music, and pictures from the phone to a DLNA-enabled TV, stereo, Windows 7 PC and other consumer electronics devices. Samsung Focus™ –AT&T’s thinnest Windows Phone offers a visually stunning experience with a Super AMOLED™ screen on a sleek 9.9 mm-thin touch screen phone. With the Focus’™ amazingly crisp, brilliant screen, photos, games and videos come alive. The Acer Aspire AS1830-3595 11.6-inch notebook, powered by the nation’s fastest mobile broadband network, offers customers high speed data access while on the go. The ultraportable notebook has long battery life and features the powerful Intel® Core™ i3 processor, which can run multiple programs at the same time. It also comes equipped with Windows 7 Home Premium, built-in Wi-Fi, HDMI, WebCAM and an 11.6 inch Backlit LED display. 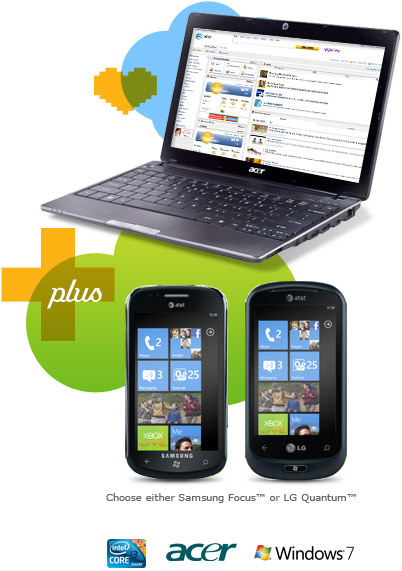 Beginning Sunday, Feb. 13, customers can purchase a Windows Phone 7 device and Acer Aspire AS1830-3595 11.6-inch notebook at AT&T company owned retail stores and online for only $199.99 (pay $299.99 and after mail-in rebate receive $100 AT&T Promotion Card. Two-year agreement and DataConnect plan required for Acer). For more details, visit www.att.com/windowspromo. 1) Mobile Broadband coverage not available in all areas. 2) Limited time offer. Windows 7 device requires a minimum data service starting at $15 a month and voice plan. Acer Aspire requires a DataConnect Plan. As to both devices, overage charges apply if you exceed your monthly data allowance. Two year contract required. Qualified customers only. Activation Fee of $36. Early Termination Fee up to $325. For full terms see www.att.com/wirelessterms. Sales tax calculated based on price of unactivated equipment. 3) AT&T Promotion Card: Price of Acer Notebook before $139.99 instant credit & $100 mail-in-rebate AT&T Promotion Card & with 2-yr DataConnect agreement is $339.99. Allow 60 days for fulfillment. Card valid for 120 days wherever major credit cards accepted. May be used to pay wireless bill. Not redeemable for cash & cannot be used at ATMs or gas pumps. Card request must be postmarked by 4/20/11. Must be a customer for 30 consecutive days to receive Card. Some restrictions & other charges apply. See terms at store or at att.com/wirelessrebate. I think this windows 7 phone is worthless! Just worthless!. Look at the apps for it, How many are worth anything in everyday life. I bought a flash light that didn’t need windows to run it. And why would i need to record! Just because they call it a app for windows doesnt mean its useful. Good god! Now lets talk ringtones. Oh wait windows phones dont offer any! Talk talk talk reminds me of my mothers phone back in 1985 but i can get on the net with it! Other then that! Oh wait I read they aren’t happy with sales, is that why they keep making games for it?. Good god Windows 7 phone andwer to everything is wait next mth or for the update so i can cut and paste. To WHAT and For WHAT. WAKE UP! Ask the right questions to the people that bought them! We are tired of waiting for anything. Glad they came out with a dial app for this phone IT FITS IT. Good God. Wow, Joe.. You own a Win7 phone? I can change ring tones….I have an HTC hd7… Not to say the phones are perfect, but none of them are.. Copy/paste…needed out of the box..Updates still in the wings… But the phones, at least the HTC are snappy, quick, sleek, fun, and do way more than I expect. My friends w/ Iphones are impressed and many of them are Apple fanatics.. Sickening. You sound like a guy that doesn’t own, nor support MS in any way.. Just a TROLL or a hater.. which are you? I guess I am just a hater of it! I got a iphone at first and had battery problems with that right off the jump, Thought being a windows phone I would be intouch with the future as I always thought windows was the best and most advance in the computer world, (excluding vista) But I am a 50 year old man and the only thing I had to learn about the windows 7 phone was to turn it on, I mastered that in under 8 seconds, I am sure the phone will be good in the future but I bought it Now. My house phone does more then a windows 7 phone and I dont have to pay extra for any of it that is the sad thing. And as Far as a MS support. I believe in MS for computers, No troll here, No MS hater, Just think they put a worthless phone on the marker and trying to pass it off as smart, Love Windows 7. Now its wait, Its like buying a new car but having to wait for the engine to be built yet it sits in your driveway and you paid for it!.